Data retention adds up when it comes to forensic intelligence, i.e. criminal investigation and national security. Yet surveillance normally conflicts with the basic right to privacy. For this reason, current legislation foresees particularly high security of traffic data (metadata!) on the basis of state-of-the-art technology, in order for data retention to comply with statutory, constitutional rights. Hence, „maximum security“, which postulates state-of-the-art technology, owes clarification. Sealed Freeze technology enjoys the German Federal Ministry for Economic Affairs and Energy’s support and was developed explicitly for this purpose, i.e. to protect metadata and yet enable privacy compliant, court-ordered access. On this note, Sealed Freeze complies with Germany’s exemplary, high privacy protection standards and is synonymous with Privacy by Design. Sealed Freeze excludes all access to metadata during memory and disclosure, even by specially authorized Sealed Freeze or telecom provider staff, at all times. 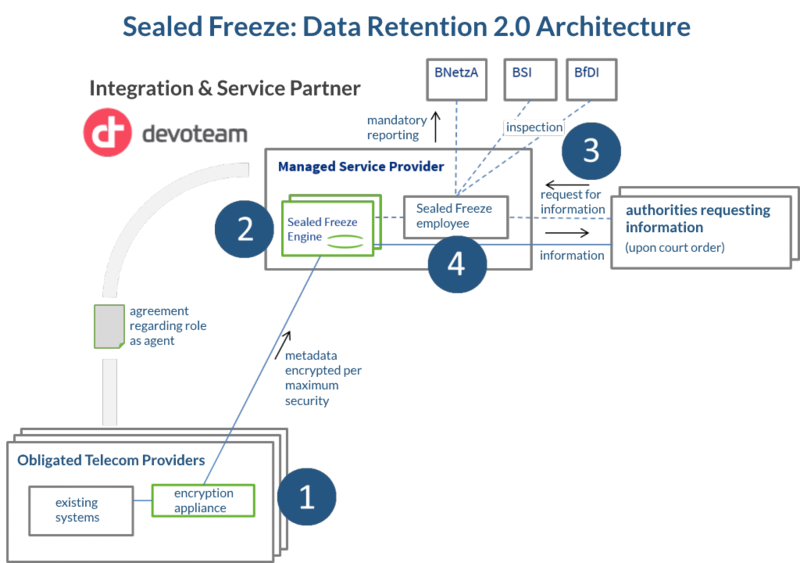 Sealed Freeze employs technical means only, to comprehensively protect data across all process phases. As a result, it constitutes a quantum leap in data security and safeguards against data abuse. Besides providing maximum security, Sealed Freeze also benefits telecom providers economically. For instance, by allowing part of the mandatory infrastructure to be outsourced and shared with other carriers. Sealed Freeze not only constitutes state-of-the-art privacy technology. It is also the most viable, cutting-edge solution to date. Obligated carries link their systems to the Sealed Freeze encryption appliance per interface (REST API). The appliance, in turn, sends the retention data to the Sealed Freeze engine in encrypted form. 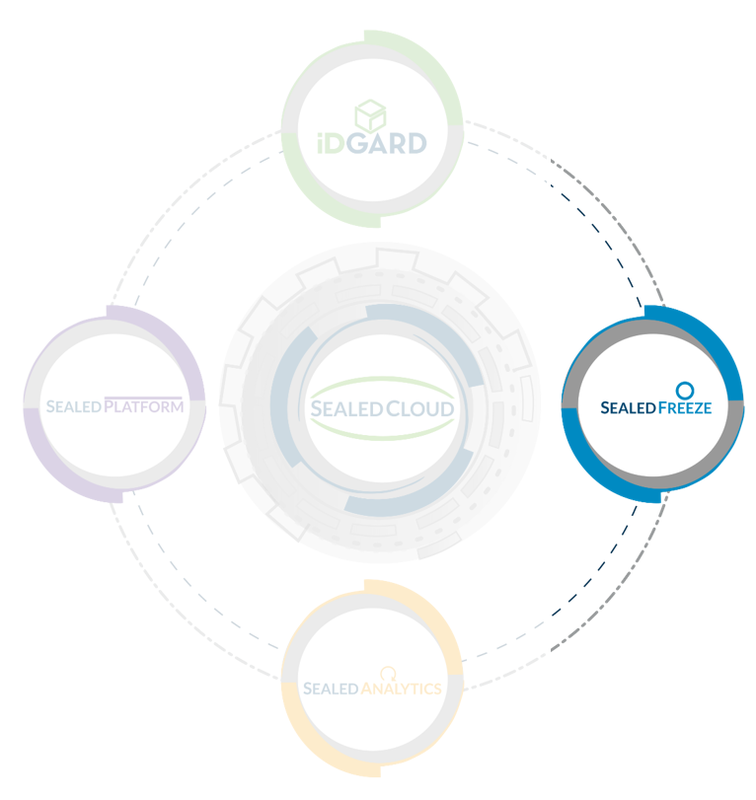 The data is stored in the Sealed Freeze engine’s memory (via Sealed Cloud technology). Contrary to conventional memory, freezing implies that all access to data lacking a court-ordered, special purpose, even per two-man rule, is excluded technically at all times. Access to said data is only possible via inquiry interface, which is only activatable upon court order for a special purpose. The interface, in turn, only discloses data pertaining to said court order. In contrast to conventional memory, the measures allowing court-ordered, special-purpose access are of mere technical nature. If a service provider receives a court-ordered RFI (request for information), it is taken up by the specially authorized party and processed in a similar vein as a trouble ticket. In other words, the obligated carrier outsources the court-ordered, special-purpose data retention service yet is still entitled, via terminal, to statistics as to recorded call data volumes (Call Data Records) and the number of submitted and processed RFIs. RFI processing pursuant to applicable TR TKÜV (ETSI XML interface), i.e.Technical Directive Outlining the Requirements for the Implementation of Legal Measures for the Surveillance of Telecommunications and Information Requests for Traffic Data. 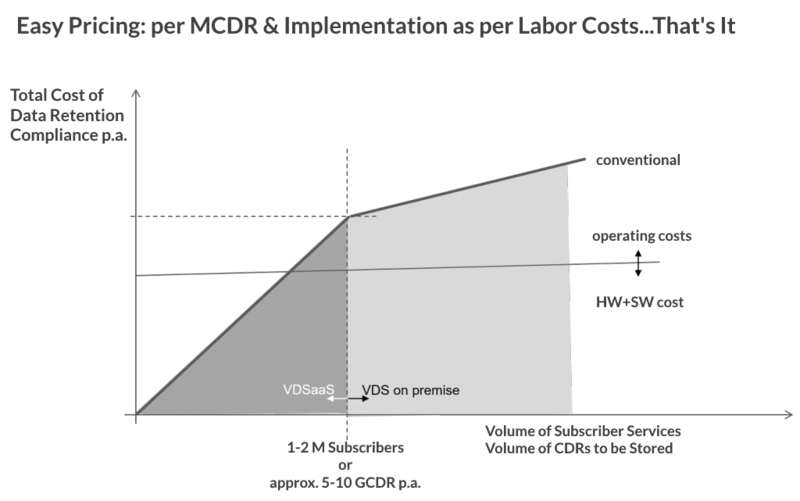 Nearly no fixed cost with Sealed Freeze, since no hardware, software, or operational costs. Focus on your business, while we do the work. Contact us for trial access!